If every phrase in every language is organized into an X-bar structure, then sentences must also have X-bar structure. This unit shows that every sentence has a Tense node (T) and every sentence is a TP. 1. 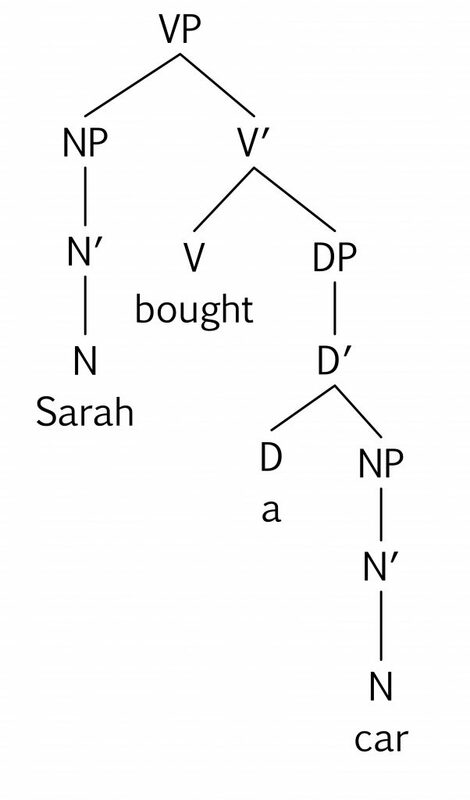 Which of the following is the correct representation for the sentence, Sara bought a car? 2. 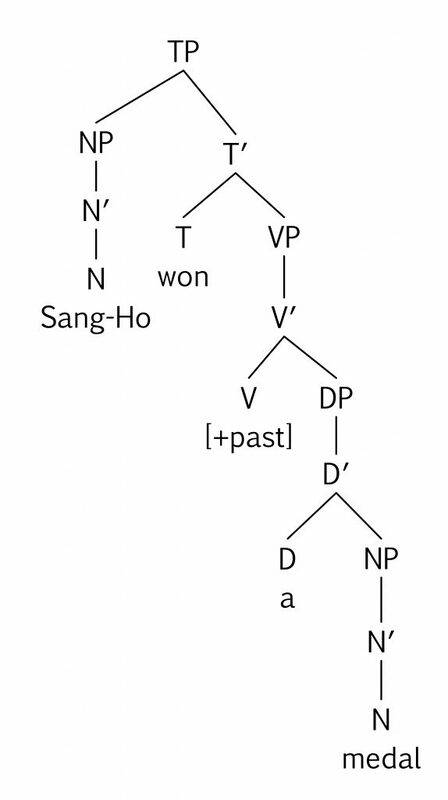 Which of the following is the correct representation for the sentence, Sang-Ho won a medal? 3. 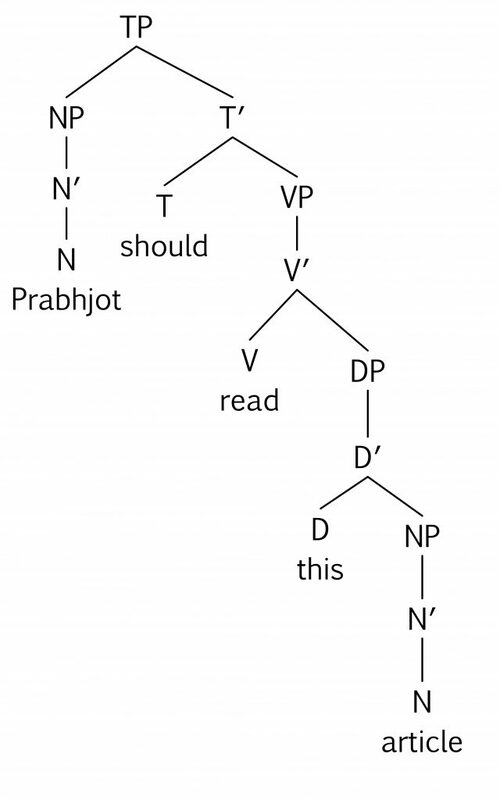 Which of the following is the correct representation for the sentence, Prabhjot should read this article? We’ve been developing a model for how the mind generates sentences. Our idea is that we draw words, morphemes, and morphosyntactic features from the mental lexicon, and then the operation MERGE organizes all these things and into an x-bar structure. And the theory makes the quite powerful claim that every phrase in every sentence is organized in an x-bar structure, with a head, a bar-level and a phrase level. So it’s fairly easy to understand that verb phrases have verb heads, and preposition phrases have preposition heads. But what kind of phrases are sentences? If we look carefully, we can observe that every sentence includes one and only one tense feature, which occupies a head position that we label as T, for Tense. And of course, where there is a head there are also the bar level and the phrase level. So a sentence is a T-phrase. Let’s see how this works in a fairly simple sentence. “Alex should try yoga.” We already know how to depict verb phrases. The verb try is a transitive verb, and the NP yoga is its complement. The modal auxiliary should occupies the T head position. A T head always takes a VP as its complement. So every sentence that we see from here on will have a T head with a VP complement. Whenever there’s a head, there’s also a bar-level and a phrase level. And the last phrase we have left in the sentence is the noun phrase Alex. It’s the subject of the sentence. We said that specifiers are kind of special, and the subject is the most special of all. The Specifier of TP is the position for the phrase, usually a noun phrase, that’s the subject of the sentence. Subjects go in SpecTP. To sum that all up, every sentence is a T-phrase. The T-head of the T-phrase takes a VP as its complement. And the specifier of TP is a noun phrase, and the name for the noun phrase that occupies that position is the subject of the sentence. What kinds of things can occupy the T-head position? The example that we just saw had a modal auxiliary in the T-head position. But not all sentences have modals in them. 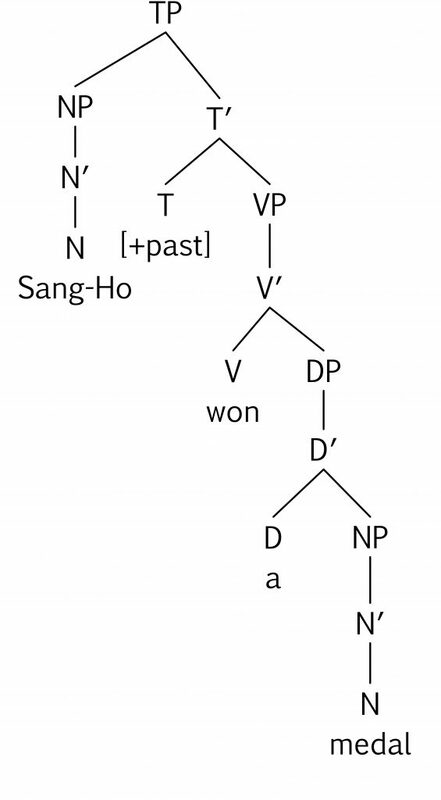 If the sentence does not have a modal auxiliary, then the T-head position will be occupied by a morphosyntactic tense feature. And when we’re looking at English, there are only two tense features, [-past] and [+past]. Let’s see how this works in another simple sentence, very similar to the last one: Alex loves yoga. Remember that the theory claims that when we draw a verb in its tensed form from the mental lexicon, we also bring along the tense feature as well. Loves is in the present tense, so it has the [-past] feature. The structure of this sentence is the same as the previous one we looked at. 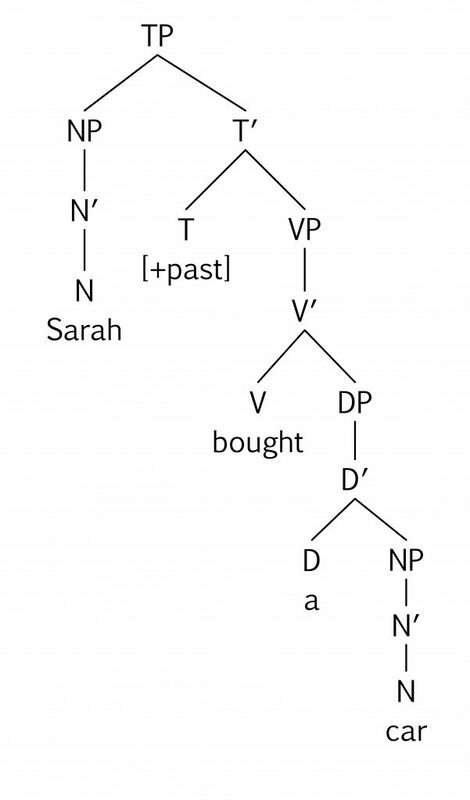 The only difference is that, instead of a modal auxiliary in the T position, we have that morphosyntactic tense feature. 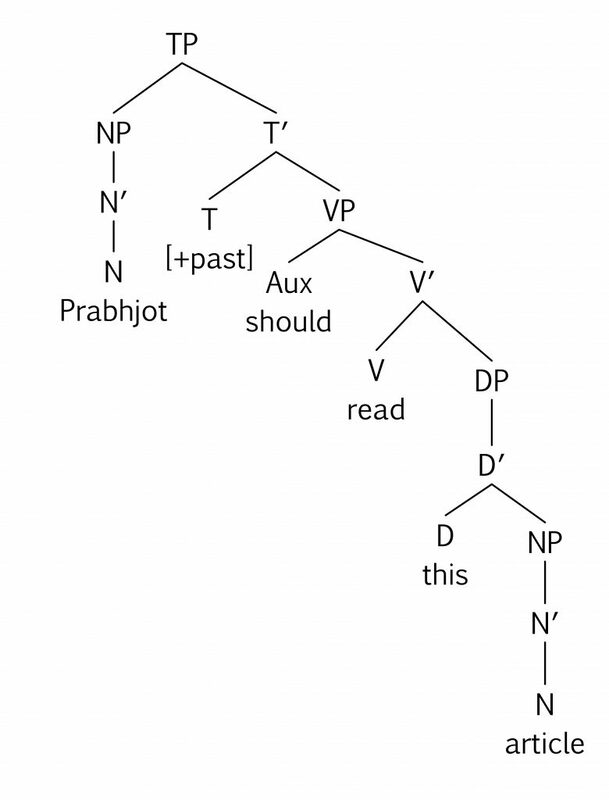 We put this feature in brackets to indicate that it’s present in our mental grammar but it doesn’t actually get pronounced when we say the sentence out loud. You could think of it as present in the underlying form, but not in the surface form. The job of this feature in the T-head position is to make sure that its complement has the correct form. Since this feature is [-past], it wants to make sure that the verb in its VP complement is in the [-past] (that is, the present-tense) form. If there were some non-tensed form of the verb there, like Alex loving yoga or Alex love yoga, the sentence would be ungrammatical.